It has been a few hectic weeks with many interesting things going on but no time at all for blog-writing. Late last month I travelled to Vitoria (Alava, Basque Country) to give a talk about a truly unique fossil site: the Miocene fossil tracksite of Salinas de Añana. Preparing that talk helped me refresh my mind about a site that had kept us busy for years with the task of deciphering an incredibly rich treasure of paleobiological information. The Salinas site preserves uniquely long trackways of 3 species of carnivores of early Miocene age (a lynx-sized felid, a domestic-cat sized felid or primitive hyaenid, and a mongoose), plus a couple of artiodactyles and two birds. But as you can see in the images below, not only the trackways are exceptionally long, but the quality of the preservation is simply miraculous. The shape and texture of the foot pads are recorded as finely as if the cat had freshly walked on wet cement in front of your eyes. Such unusual preservation revealed to us that some cats of the lower Miocene were almost, but not not quite as fully digitgrade as our modern felines; that they “changed gears” from walk to trot with increased speed in a thoroughly cat-like manner, and that they travelled as family units of mother and young at least until the cubs were fully adult sized. We also found that the foot morphology and locomotion of early Miocene mongooses were fully modern, which was a welcome piece of information since the post-craneal skeleton of those creatures was and remains virtually unknown. The amount of information contained in the bare 70 square metres of exposed sediment was so huge it took us years to publish our interpretation of the carnivore trackways . But the delicate nature of the sediments made them quite fragile too. After the second field campaign in 1993 the site was re-buried, and has remained so since then. If we should open the site without proper protection it would quickly erode away under the weather, so until the regional authorities provide some sort of legal protection and funding for preservation, the trackways will remain hidden from view. It is ironic that, after 18 million years under rock, the site has spent 18 years under earth. Not only is this a lost opportunity for refined research and for paleontological tourism at the locality, but also it is to be expected that, if we excavate a larger area, more ichnological surprises will appear. By the way here is the reference to our Salinas publication: Anton, M., G. López y R. Santamaría, 2004. 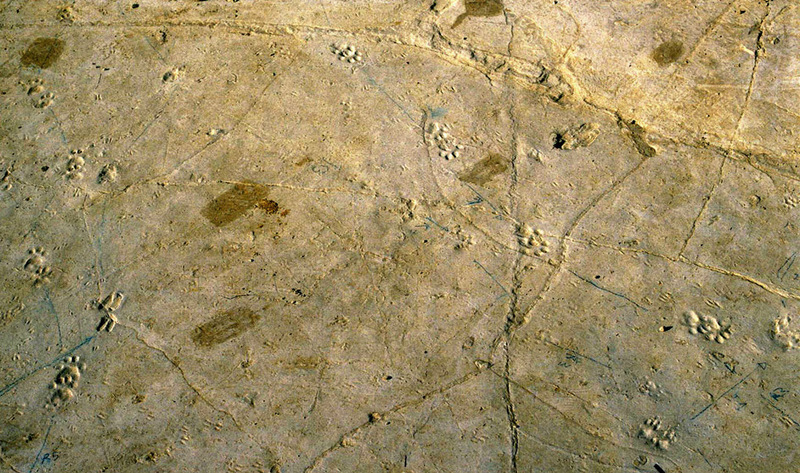 Carnivore trackways from the Miocene site of Salinas de Añana (Álava, Spain)Ichnos11: 371-384 . Trackway of a lynx-sized Miocene felid from Salinas de Añana. After reading my previous post, readers may think, OK, these early felid footprints look interesting but, did not sabretooths leave footprints too?. Obviously they did, but the fossil record of their tracks is very poor. This is unfortunate because not everyone agrees on the details of sabretooth locomotion, and some specialists have proposed that animals like Smilodon, or the nimravid sabretooths, were plantigrade, walking on the soles of their feet like bears, rather than walking on digitigrade, cat-like feet. We would need several fossil tracksites similar to Salinas de Añana, but from different times and places, to help us solve these uncertainties. There are, anyway, a few sites that have yielded the footprints of sabretooths, and in one of these sites we have the uniquely lucky coincidence of finding both the footprints and the direct fossil remains of the animals themselves. That place has been known for many decades, and is one of the classic sites that helped define the Hemphillian, an age within the late Miocene of North America (formerly thought to be part of the Pliocene): Cofee Ranch, in Texas (see: Johnston, C. S. 1937. Tracks from the Pliocene of West Texas. Am. Midl. Nat., 18(1): 147-152). At Cofee Ranch, the most complete skeleton known to date of the sabretooth Machairodus coloradensis was found not far from the footprint of a large cat-like animal. The well preserved footprint measures 13,2 by 11 cms, and is thus larger than most modern lion footprints. 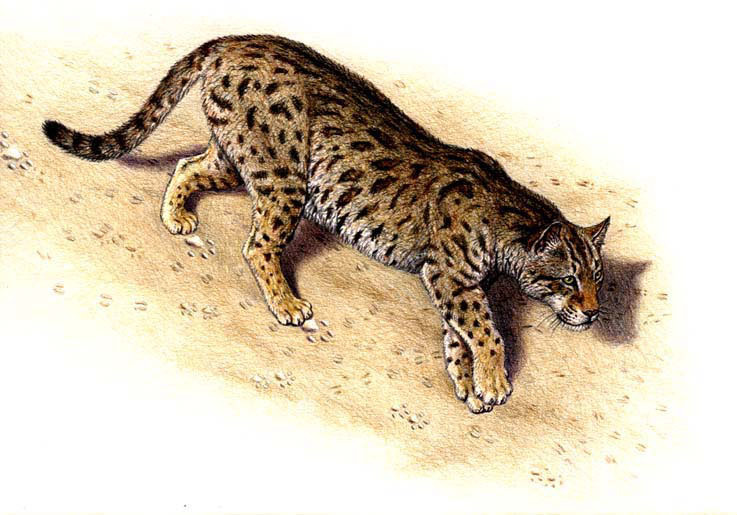 At that time, conical-toothed cats of the modern subfamily felinae were smallish animals, none of them larger than a lynx, and the only cat around that was large enough to leave such a huge footprint was Machairodus. The morphology of the Cofee Ranch cat print is quite modern, with paraxonic shape, retracted claws, and a reduced interdigital pad, and indicates a fully digitigrade posture. This morphology nicely fits what the known osteology of Machairodus and its relatives of the Homotherin tribe already told us – that these cats walked and ran much in the same way as our lions and tigers do. The detailed anatomy of Smilodon suggests so much as well, but the animal was much more robust and short-limbed than Machairodus, so a nice set of footprints from some Ice Age fossil site would not hurt. And the nimravid and barbourofelid sabertooths, with their primitive-looking feet are more difficult to interpret in terms of locomotion, so we must hope that more Miocene tracksites will be discovered in the future, including some sabretooth trackways. Meanwhile, functional anatomy will be our only guide to reconstruct their locomotion, and detailed, updated studies are urgently needed on that field too.